News and information from the theme park capital of the world. Sorry for the delay but the app update will be postponed until Tuesday. Too many other things going on to do a decent job. 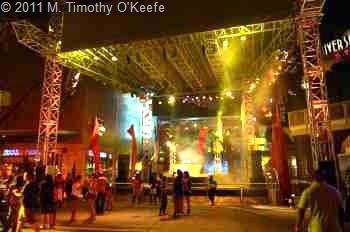 Just the name “Mickey’s Not-So-Scary Halloween Party” perfectly distinguishes it from the better known adult gross-out Halloween Horror Nights at Universal Studios. The Disney Halloween event with nothing very threatening is perfectly suited for young children. 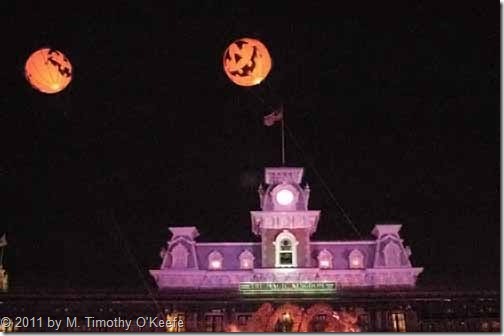 It’s actually a giant trick-or-treat party with children encouraged to dress in a costume and accumulate as much candy as they can while wandering through the Magic Kingdom theme park, occasionally encountering Disney characters and villains in their own special Halloween costumes. Held on select nightsfrom now until Oct. 31, Mickey’s Not-So-Scary Halloween Party is a separate ticket event held from 7pm-midnight, which makes this unsuitable for very young kids since they are likely to fall asleep by 9pm. Mickey’s “Boo-to-You” Halloween Parade with Disney Characters and the stars of the Haunted Mansion attraction. The Happy HalloWishes fireworks show where the Disney Villains go trick-or-treating in the sky. Disney does this right. I’ve attended several times and it’s been just as much fun for adults as children. I mean, well, let’s face it–we never outgrow that Disney magic. And this celebration is loaded with it. This is a weekly info update to the Orlando Essential Travel Guide for buyers of the app and anyone who discovers this site. More than 270 chefs including Disney chefs and culinary stars from across the country will conduct culinary demonstrations and host dinners and tasting events. Celebrity chef appearances include Jeff Henderson, Cat Cora, Alan Wong, Gale Gand, Suvir Saran, Jamie Deen, Rock Harper, Celina Tio, Robert Irvine, Andrew Zimmern, Buddy Valastro, Warren Brown, Art Smith, Keegan Gerhard and more. It’s possible to spend a day of exploring the World Showcase Promenade. The tapas-sized portions of regional specialties run $3 to $8 each, with suggested pairings of wines, cocktails and beers. Instead of paying for each market sampling, you can buy a festival-themed mini-Disney Gift Card you wear on a wristband and load and reload at several park locations. 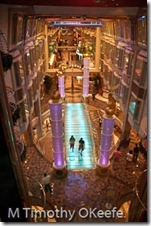 Live daily entertainment includes music, acrobats and improvisation performances along the promenade. Kicking off the festival from Sept. 30-Oct. 2 are former members of ELO and Gin Blossoms. Appearing for the first time on the Eat to the Beat! stage are The Pointer Sisters. Ending the festival Nov. 11-13 are fan favorites Taylor Dayne and Big Bad Voodoo Daddy. Disney is advertising that The World Showcase will feature a return of “Captain EO,” a musical 3-D production starring Michael Jackson. 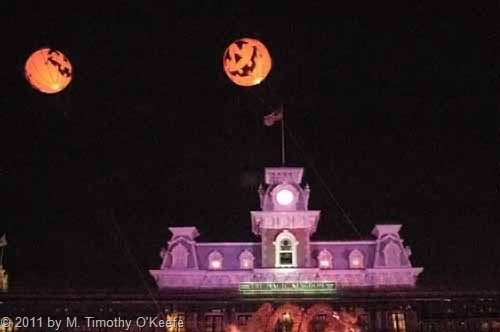 That seems a better Halloween addition for Universal’s horror-fest and not Epcot’s International Food & Wine Festival. Watching this video when it first came out was scary years ago before knowing the talented singer had a strange fascination with young children. Now that we do, to advertise it as a possible appetizer or dessert for Epcot’s world-class dining experience? 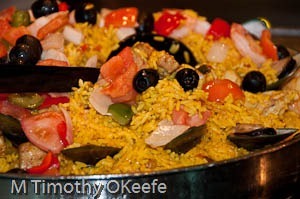 Taste seminars and Authors Without Borders programs with special book signings at the Festival Center, Eat to the Beat! 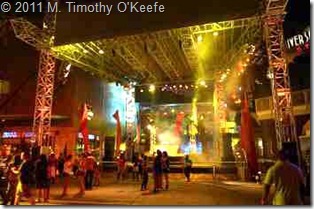 concerts, cultural adventures, Marketplace Discovery Passport and all attractions and park entertainment are included. Senses grand tasting events and other special culinary and beverage programs require reservations and separate event admission. 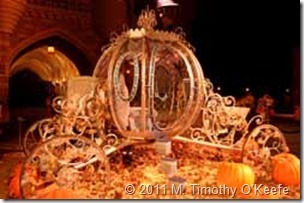 You can call now 407/WDW-FEST (939-3378) for information and to make reservations for special events and programs. 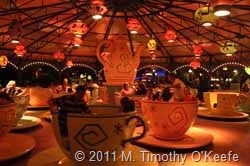 For details about everything, visit www.disneyworld.com/foodandwine. 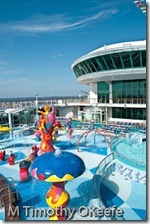 Part 1 explained how Universal Orlando Resort and Royal Caribbean offer a resort/cruise combo. In Part 2, I detail why we decided to stay at Universal Orlando instead of commute from home, just 45-minutes away. We recently drove our 3 Virginia grandkids from Richmond to Orlando for a much anticipated visit to Universal Orlando Resort. 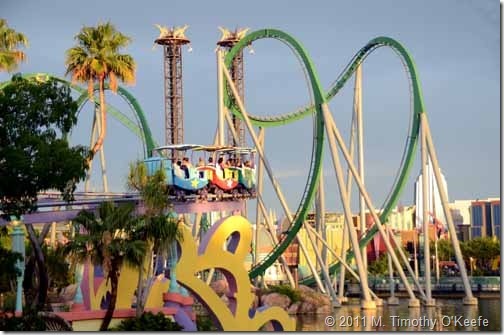 Although we live just outside Orlando, our grandkids never have visited any of Orlando’s famous theme parks except SeaWorld, many years ago and just for a single day. Anytime since when in Florida, their father (who hates crowds and refuses to wait in long lines) always has vetoed another theme park visit. Well, Linda and I have the same long line phobia but know of ways to avoid them. And since the 3 grandkids are ages 15 and 11 (twins, boy and girl), it seemed they were overdue for an in-depth theme park visit. So we kidnap them for a week (with parental permission) for a theme park excursion involving only truly “grand” people as kid or parent. The grandkids have free reign to choose which park to visit when. Their only interest is Universal Orlando Resort, something of a surprise since they watch the Disney Channel all the time. Harry Potter, not Mickey Mouse, is foremost on their minds. 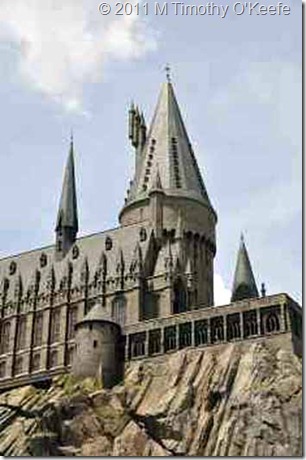 Although the grandkids are aware from friends that Harry Potter makes up only a small part of the Islands of Adventure, Universal is where they want to go. As Orlando area residents, the obvious choice for us is to overnight at home and commute to the park. Universal, however, sometimes offers surprisingly good hotel discounts for Florida residents, although I don’t expect to find any deals during the peak summer period. Universal’s 3 on-site themed hotels are all AAA Four Diamond Award-winning properties: Loews Portofino Bay Hotel, Loews Royal Pacific Resort and the Hard Rock Hotel. Doing my advance research online in Virginia, the best offer for the 5 of us appears to be the Hard Rock Hotel. 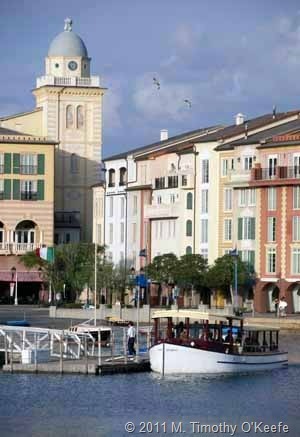 However, it’s a good thing I call to check the online rates with a Universal reservationist who tells me that because I am an annual passholder as well as a local resident, she can save me another $120 a night at Portofino Bay vs. the Hard Rock. The room rate comes to just over $300 a night for the 5 of us, a rate that makes staying at home a poor option. Besides the convenience of staying on-site and not having daily to fight I-4 traffic to and from Universal, the hotel perks will make it cheaper to stay there. Each of us will receive a free Universal Express ride pass, which normally costs around $87 per person per day. Multiply the value of the Express ride pass by 5 and they’re worth $100 more per day than the room we stay in. The Universal Express ride passes turn out to have an extended bonus. For instance, by staying for 3 nights, the passes actually are valid for 4 days. They are valid the day we check-in, starting at whatever time we pick up them. It could be as early as 7 a.m. even though the official check-in time is 4 p.m. In the meantime, the hotel holds the luggage until a room is ready. Our check-out time will be 11 a.m., but the Universal express ride passes remains valid for us that day until the park closes. Not what Linda or I expected: that’s a lot of bonus ride time. All of us have 4 days of front-of-the-line rides for the price of a 3-day hotel stay and a 3-day park pass for the grandkids. Arriving at the Islands of Adventure, we put the Universal Express ride pass to the test. Supposedly, just showing a hotel room key card would get us into a special express lane that bypasses the often long waits. Besides jumping to the front of the line, the 5 of us would be able to re-ride the same attraction immediately, over and over. No need to make ride reservations, as at Disney World (which also has many more visitors waiting for a ride). Linda and I decide to initiate roller-coaster loving grandkids to Universal with the Incredible Hulk roller coaster (we’re bad!). Living in Richmond and frequent visitors to Bush Gardens in Williamsburg, the grandkids all agree the Hulk is indeed incredible. Twins Emily and Andrew brave a second go-round, which includes 7 inversions and accelerates to 40 mph. Next, the 5 of us ride Spiderman 3 times in a row within about 20 minutes. The grandkids love the no-wait express pass. They have no idea of the wait times the typical visitor endures on a theme park visit. The Universal Express ride pass spoils them by the end of our trip. Most of all, us too. Part 3: What the grandkids think of their Universal experience. And more reasons why anyone planning a Royal Caribbean cruise from Port Canaveral should seriously consider bringing their youngsters to Universal Orlando. One of the advantages of visiting Orlando off-season are the available discounts. September is the Magical Dining Month organized by Visit Orlando, the only officially recognized sales and marketing organization for the Orlando and Orange County area. Featuring a wide variety of the Orlando area’s best restaurants, the Magical Dining Menu has a fixed price of $30 per person, per meal, for dinner only. You select 1 item per course, with no substitutions. Price does not include tax or gratuity. The Magical Dining Month menu cannot be combined with additional discounts or promotions. Reservations subject to availability. 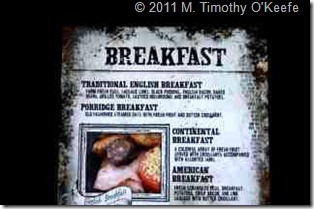 Click on a restaurant to see its 3-course dinner menu. For a reservation, click the online link or call the restaurant. 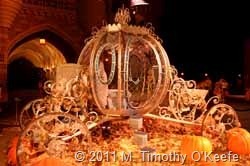 However, those without reservations need only ask for a Magical Dining Month menu. Another weekly update specifically for the buyers of Orlando Essential Travel Guide iTunes app but also anyone else who comes to this blog. Tim and I are not fans of roller coasters. 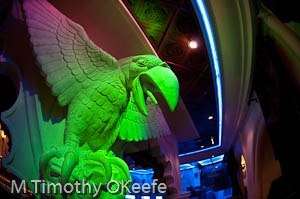 But after 3 days at Universal Orlando Resort, we’ve considered retesting our old fear factors. 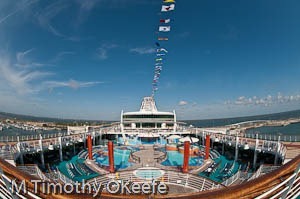 And thought about combining a stay at Universal with a Bahamas or Eastern Caribbean cruise from nearby Port Canaveral the next time the grandkids are in town. Universal Orlando Resort and Royal Caribbean Cruise Line have a partnership that brings together two of the world’s most popular vacation providers with a variety of getaway packages. 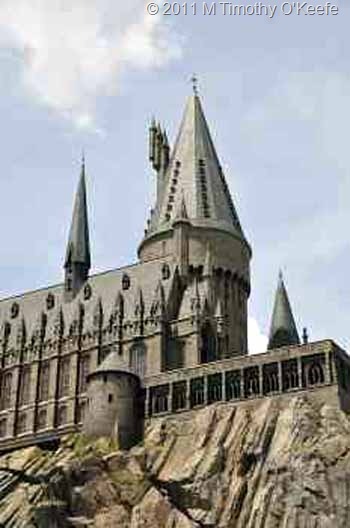 And with the world’s only Wizarding World of Harry Potter theme park located at Universal’s Islands of Adventure, the theme park/cruise combo is more enticing than ever. 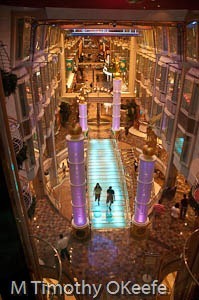 For the cruise portion, the choices are a 3- or 4-nights aboard Monarch of the Seas or Jewel of the Seas and a longer voyage on their much larger sister ship, Freedom of the Seas. All ships offer the complimentary Adventure Ocean youth program for ages 3-17 with separate activities for designated age groups and their own dedicated spaces. The daily programs start at 9am for younger children, while for those 15-17 their true party time begins in their own night club at 10pm and ends well after midnight. With all of the Adventure Ocean activities supervised by the ship’s trained personnel, parents actually do have the opportunity to relax and enjoy some adult time without worrying whether their kids are bored or getting in trouble. 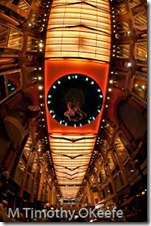 The Monarch and Jewel calls in Nassau, Bahamas, and at CocoCay, Royal Caribbean’s private island in the Bahamas. CocoCay offers the usual water sports options as well as an Aqua-Park for children, beautiful beaches, shaded hammocks, a beachfront barbeque, and a straw market. 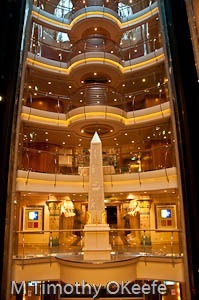 Shipboard life on the Monarch and Jewel include Broadway-style musical revues; Vegas-style gaming in Casino Royale; a rock climbing wall and the opportunity to just plain relax in the Day Spa. Don’t worry whether your kids will miss you. 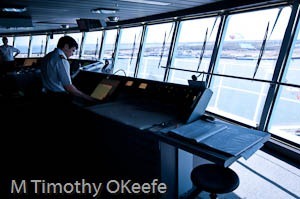 They have more varied on-board fun opportunities than adults. 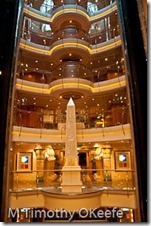 For a longer cruise, Freedom of the Seas has alternating week-long itineraries in the Eastern and Western Caribbean. The Eastern Caribbean option includes 3 days at sea with stops at St. Thomas, St. Maarten, and CocoCay, RCCL’s private island. On Freedom’s Western Caribbean sojourn, passengers spend only 2 days at sea and stop at Ocho Rios, Jamaica; George Town, Grand Cayman; Cozumel, Mexico; and Labadee, a private resort on the north coast of Haiti. Since 1986, RCCL’s Labadee stops have provided largest proportion of tourist revenue to the impoverished island’s economy. Although often described as an island, Labadee is not an island but a peninsula adjoining Haiti. 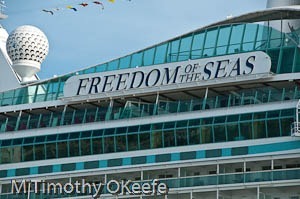 Because of its large size, Freedom of the Seas can offer many activities not available on Monarch of the Seas. 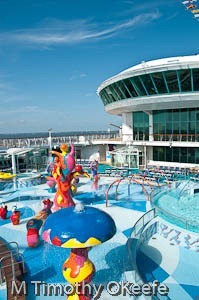 Facilities like the FlowRider surf simulator; the H20 Zone water park; Studio B ice-skating rink; a full-size boxing ring; cantilevered whirlpools suspended 112 ft. above the ocean; Chefmakers Cooking Academy; Karaoke Superstar and more. The recently added Dreamworks Experience allows youngsters to interact with popular Dreamworks characters such as Shrek and the Penguins of Madagascar. 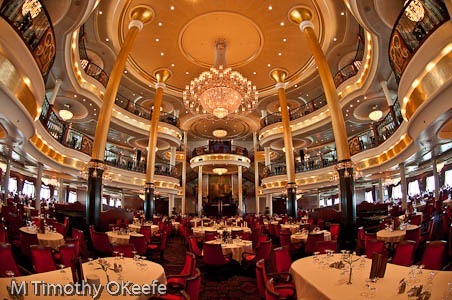 For dining, there’s a choice of eight onboard restaurants, including Royal Caribbean’s signature specialty Chops Grille steakhouse, Portofino Italian restaurant and a Johnny Rockets 50’s-style eatery; you can be sure no one will go hungry. 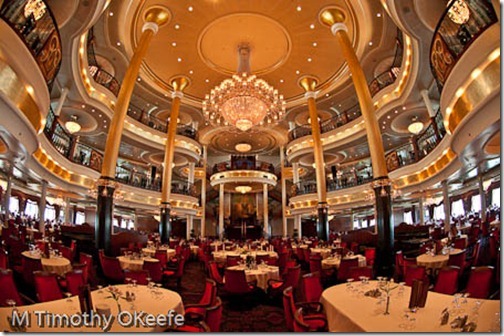 These cruises (see sample of all itineraries) are exciting by themselves but coupled with the fun of Universal Studios and Universal’s Islands of Adventure plus the entertainment/dining at CityWalk , your trip really could fall into a one-of-kind vacationalooza. In Part 2, we’ll talk about the experience with our grandkids at Universal Orlando and why Florida residents (like us) with visiting guests may be foolishly throwing money away by staying at home and not moving everyone into one of Universal’s hotels. The theme park extras you receive for staying on-property are likely to dwarf the hotel room costs. 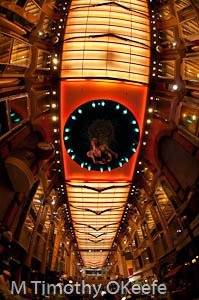 All photos taken aboard Freedom of the Seas. By now, most web savvy users should be familiar with Groupon and its online daily deals for local goods and services offering discounts between 25%-90%. If you’re interested in the daily deal, you simply purchase it online and print out a coupon for redeeming a restaurant meal deal or attraction discounts. Orlando’s daily deals, which can be tracked on your computer regardless of where you live, should be monitored by anyone planning a trip there since they can be good for as long as 6 months after purchase. Groupon has expanded it daily offerings with a new service called Groupon Now! At the moment it’s being offered in only one city in each state, and Orlando is its first choice Florida pick. Instead of a single daily deal, Groupon Now! describes scores of local deals—not 200 of them as its Orlando Groupon Now! website currently claims. Give them a few months since Orlando’s Groupon Now! service started only last week. Groupon Now! divides the savings into more than a half-dozen categories (some definitely of more interest than others, as you will see). The Groupon Now! offerings are supposed to change regularly, according to this time schedule: 6am-10am; 10-am-2pm; 2pm-6pm; 6pm-10pm; 10pm-6am. Besides looking at Today’s Deals, you can also look at tomorrow’s for the same time periods. Here’s the current category listing with current examples. Suspect these categories are likely to change since several seem of minimal interest to locals and visitors. Here’s the current Orlando Groupon Now! category listing with current examples. Suspect these categories are likely to change since several seem of minimal interest to locals and visitors. Eat Something — Restaurant discounts, the largest category often providing some excellent deals. Featured Deal, All Deals and Getaways are also listed at the top of the page in the header list. Featured Deal is the original featured daily deal and often the best of the best. All Deals includes the Featured Deal and other Daily Deals that may not have sold out. Getaways contains resorts from all over the world, including Florida, as well as rental car companies. Live Entertainment is a new Groupon venture, so new that it does not yet have a web site (as of today). You provide your email address and emails for your location are sent whenever something is available. I’m still waiting for my first. For Orlando, this could be a very popular category. Free Groupon mobile apps for both Apple and Android products. Including Groupon Now!, making it easier to keep track when you’re on the move. 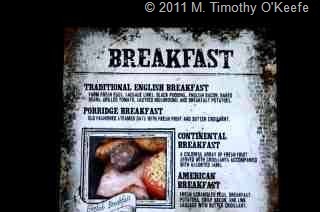 INTRO: This is the first of a weekly update for those who have purchased my app, Orlando Essential Travel Guide. If you have stumbled across this site because of the relevant info, Welcome! You might consider purchasing my best-selling app, too. WHY: The current financial fiasco co-created by President Obama (who had no economic plan and whose staff has characterized him as “leading by following”) and Congress (where both parties displayed spectacular ineptness bordering on delusional). Together, they managed to do what never had been done before: Cost the U.S. its AAA rating, which sent the U.S. stock market into a downward spiral and made many people wary of vacation travel. 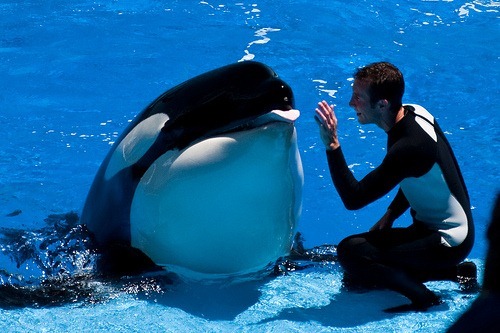 WHO: SeaWorld Orlando and its parent company SeaWorld Parks & Entertainment had such impressive gains this year–until the government-created crisis in August, which has made many people afraid to travel because of their stock market losses. Rather than wait until fall, a season of traditional Orlando discounts due to fewer visitors, SeaWorld Orlando is acting now to offer steep discounts to attract guests with some truly special specials that end Dec. 25. WHAT: Buy 2 Nights, Get a 3rd Night Free! Book a vacation package at least 48 hours ahead of time at one of SeaWorld Orlando’s participating Partner hotels or in one of the Official Hotels of SeaWorld, and your 3rd night is free as long as the stay is completed before December 25. In addition, at least 2 park admission tickets must be purchased with each package. Admission not required for children under 3. A very significant bonus is that the $29 All-Day Dining Deal is free with each paid admission. And you can add the popular Aquatica water park (or Busch Gardens Tampa) at a special rate of $39, where you can dine there free all day, too. SeaWorld Orlando’s has 6 official on-site hotels. Three are part of the Marriott chain and offering several new guest services, are the Renaissance Orlando at SeaWorld, SpringHill Suites Orlando at SeaWorld and Fairfield Inn & Suites Orlando at SeaWorld. The 3 Hilton brand hotels are Doubletree by Hilton Orlando at SeaWorld, Hilton Garden Inn Orlando at SeaWorld and Hilton Grand Vacations at SeaWorld. 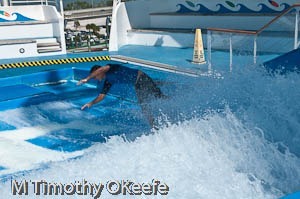 Free transportation to SeaWorld, Aquatica, Discovery Cove and Universal Orlando. Early entry to SeaWorld and Aquatica during designated summer and Christmas holidays, which may not fall during this package special. Exclusive access to the “SeaWorld Rescue Tour” at SeaWorld on early entry dates, which do not occur in the fall (see above). Also, check to see if you can arrange your vacation through Southwest Airlines and receive free air fare as well as 2 free checked bags per person. Their vacation search form allows you to put together a package that includes flight, hotel, car and SeaWorld admission tickets. WHY: Aren’t there more free nights if you want to stay longer at SeaWorld Orlando? SeaWorld is making itself attractive for only 3 days, passively accepting its 3rd place behind Disney World and Universal Orlando. Based on the world-wide data from the Apple store app buyers of my Orlando Essential Travel Guide, SeaWorld Orlando has no clue about the international interest in Aquatica. Neither do the other Orlando theme parks. Until next Monday (if not before). So many things happen so quickly between revisions of the Orlando *Essential* Guide that in order to get info out to you faster when something new happens, it will be posted here on my blog site. This will happen on a weekly basis, not a daily one, because this app is not my life (most 0f the time). As this is written , Version 1.8 of the Orlando *Essential* Guide is at Apple. With updates and new entries, it contains 25 percent new material, 242 total; entries and photos now number over 2,100. Because of the amount of work involved, the app is increasing from $2.99 to $3.99 to match what already has been charged by some other Sutro apps since the beginning of the year. If you already own the app, you won’t notice the price change because your update is free. This is the first price increase ever for this app. Moreover, Essential Orlando also is the first Sutro app to provide scheduled content updates between revisions. Orlando Updates should appear every Monday on this blog. Since other articles may have appeared related to different travel destinations, under Categories on the right side of the page click on Orlando, FL . That will take you to the latest posting. If you are not linking to the blog from the Essential Orlando app but decide to type in the name Travels with Tim O’Keefe, make sure you add “/” or you’ll end up elsewhere, on my website Guide To Caribbean Vacations. You’re certainly welcome to browse there but that’s not where you were headed. BEST OF ALL It’s now easy to tell me what you want to see added in the next revision. With so little feedback, it’s hard for me to know for certain what you’re looking for that might not be covered. I’m making educated guesses based on what I want to know when I travel somewhere. Meaningful comments and suggestions are more than welcome. For instance, someone wrote asking if there were zip line locations in or near Orlando. I answered her and then in the new revision added a zip line category covering the four major zip line attractions, two new just this year. Most visitors probably don’t know about them yet. You will because someone asked a question. The massive addition of area beaches (3,300 words of beaches coverage, that’s massive for any category) resulted from a suggestion I received in the app’s comments section. Since Central Florida beaches are not close to the theme park area, beaches was a topic I was planning for down the road. But someone asked for it and beaches from Flagler to Cocoa went into the March revision. This blog should allow for more suggestions. If you have one, or if you found a new restaurant you want to tell others about, Leave A Reply at the bottom of a post. Unlike Facebook and some other social media, this blog is open to everyone. Tell a friend, and tell them about the app. I can’t promise to answer personally more than a few questions a week and sometimes not even that. 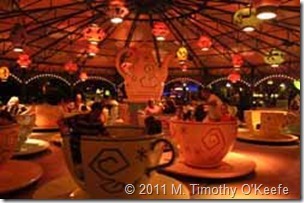 The main purpose of this page is to post Essential Orlando Travel Updates. Hope you like the new feature! If you found this page early, look for the first update post next Monday, August 22. Find what you need to know before you go! 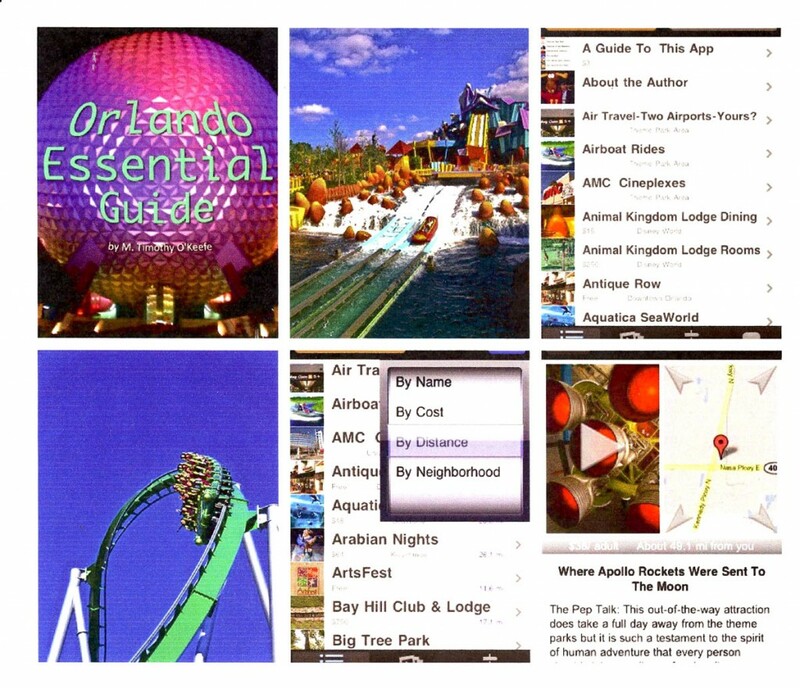 If you or someone you know is coming to Orlando, downloading the best-selling iTunes Orlando *Essential* Guide is one of the smartest to prepare for your trip. With 200 entries and almost 1,700 photographs, this iPhone/iTouch/iPad compatible app will eliminate most of the uncertainty whether you are a first-time or tenth-time visitor. With almost 100 attractions near Orlando, how do you know which ones to see and which major theme parks really deliver? Where the locals go to eat, drink and play? Find out with this essential guide to Orlando’s very best. Open any entry and you will find the following items: text description, live web links, slide show and a map with live GPS that will plot the route to take you to the attraction’s parking lot. How convenient is that? Cost of the app is only $2.99 and it comes with free lifetime updates–even if the price of the app increases.